Riding holidays in Israel are a wonderful way to experience the country’s fascinating culture, and see its uniquely beautiful scenery - from the stunning Jordan valley to the haunting scenery of the southern desert. Biblical characters will be brought to life as you ride to the sites of ancient battles and visit places mentioned in the Old and New Testaments. These trips are about more than just riding, we've included walking tours of the important holy sights of Nazareth, Jerusalem and a visit to the Dead Sea. Two exhilarating and captivating tours of Israel, its history people and nature. Choose from the six night Israel Adventure or the longer eight night Tour Israel itinerary. 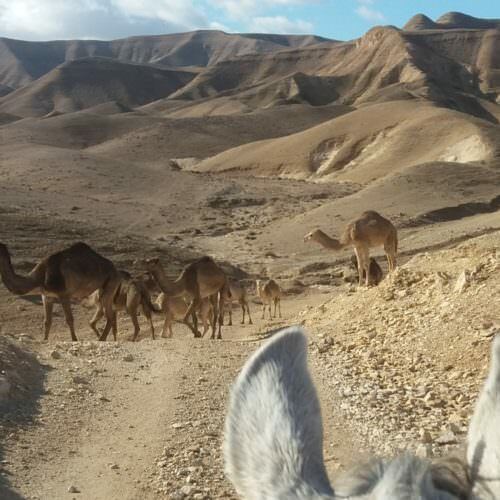 Each trail gives you the chance to ride in both the northern and southern parts of Israel, along with visits to many historical sites and a day in Jerusalem. Focussing on the fertile Galilee area and Jordan Valley this six night itinerary offers a combination of riding and an insight into the rich cultural history of Israel. This is a beautiful part of Israel and the terrain lends itself to some wonderful riding.